A hand wringer is an ideal appliance for removing water from your swimsuit. The spin dryer works on centrifugal force and electricity, but is not the same as your tumble dryer. Centrifugal force requires a curved movement and draws the clothing away from the center, separating water from fabric. Both appliances remove the dripping water by spinning, but you will still need to use a tumble dryer for complete drying of a garment. A hand wringer is an inexpensive drying appliance. A hand wringer uses manual labor as you must turn the crank to feed the garment through the rollers. The wringer squeezes the water from the clothing. The water spills into a bucket or on the surface where the wringer sits. There are no electrical parts. 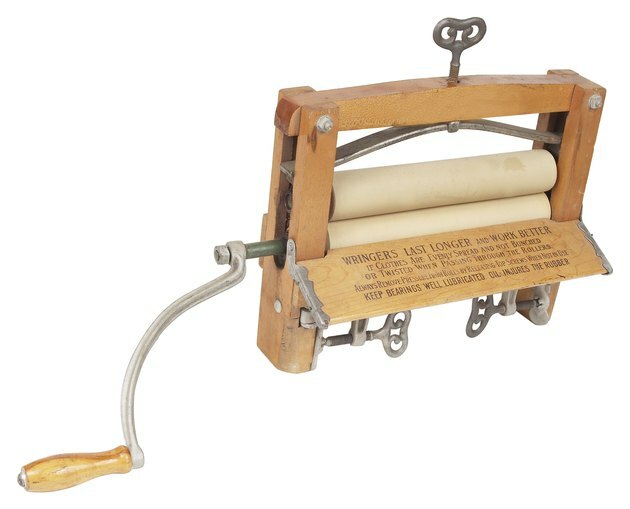 Hand wringers get wet clothes sufficiently dry that they can be dried flat or hung on a line to dry completely. Spin dryers are typically smaller than a standard tumble dryer and work best with just a few items. As its name implies, a spin dryer spins the garments inside a cone. The water swirls to the bottom center and runs out of a spout into a receptacle. The clothes are not completely dry when removed from the spin dryer after its two- or three-minute cycle. However, clothes may feel dryer than those run through a hand wringer. The spin dryer saves energy compared to a tumble-dry process. The spin dryer has a lower purchase price than a conventional dryer and costs less to operate. The spin dryer supplements your tumble-dryer; however, it does not take its place. If you favor green living, you can dry clothing in the spin dryer then hang it up to complete the drying process. Cotton items will need to be ironed or tumble-dried. The spin dryer dries clothing sufficiently to shorten the drying time in a conventional dryer. Use the spin dryer in conjunction with your standard dryer to save energy and drying time. The hand wringer is an ideal manual appliance for bathing suits at the pool or for campers on the road. The drying process allows you to bag up your clothing to take home or to hang dry. Swimwear made of Lycra and Spandex does not hold up well to the heat and tumbling of a conventional dryer, but the hand wringer creates no heat and is gentle. The hand wringer is low-cost for its initial purchase price and is less expensive to operate than either the spin dryer or conventional dryer. Can You Dry Rayon in the Dryer?